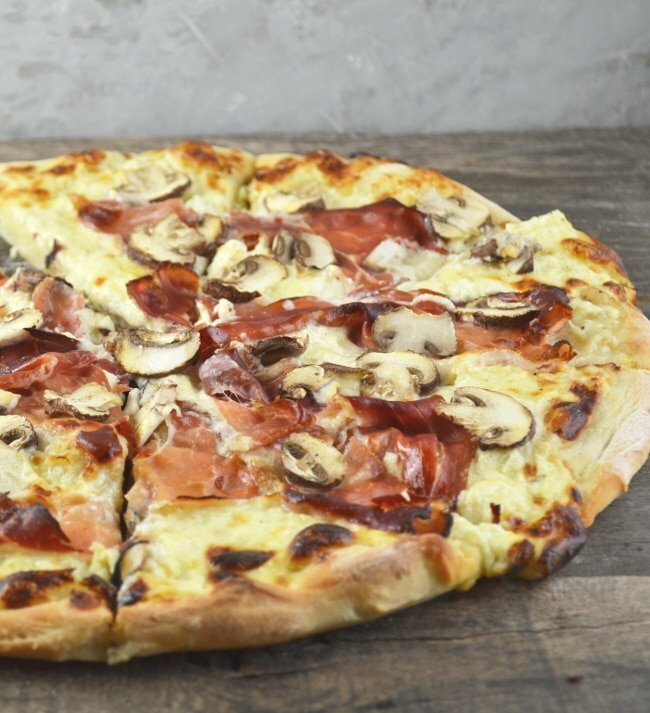 This Extra Cheesy Speck and Mushroom Pizza is to die for! Get prepared for the most delicious pizza you’ve ever tasted and it couldn’t be easier! For a long time now this has been my absolute favourite pizza base, forget tomato sauce it’s all about the most perfectly cheesy and indulgent white based pizza.
. It’s still one of my favourite cookbooks written by two amazing Italian chefs that are based in the UK, Antonio Carluccio and Genaro Contaldo. All of their recipes are insanely good and always nice and simple to make, that’s what I love about Italian cooking. This pizza was inspired by the Alpine Pizza in the Greedy Italians book. It’s a pizza made in the North of Italy that calls for Gruyere cheese and Creme Fraiche mixed together for a base. It’s then topped with salami, red onion and marjoram. Where I live in Tuscany it’s very hard to find Gruyere cheese. Only certain supermarkets sell it and not all year round so I had to find another alternative that would work perfectly for this pizza and that my friends is Fontal. Fontal is a very common cheese in Italy, it’s very similar to Fontina which is more well known. I love it and use it for sandwiches, bechamel sauces and all sorts of cheesy bakes. 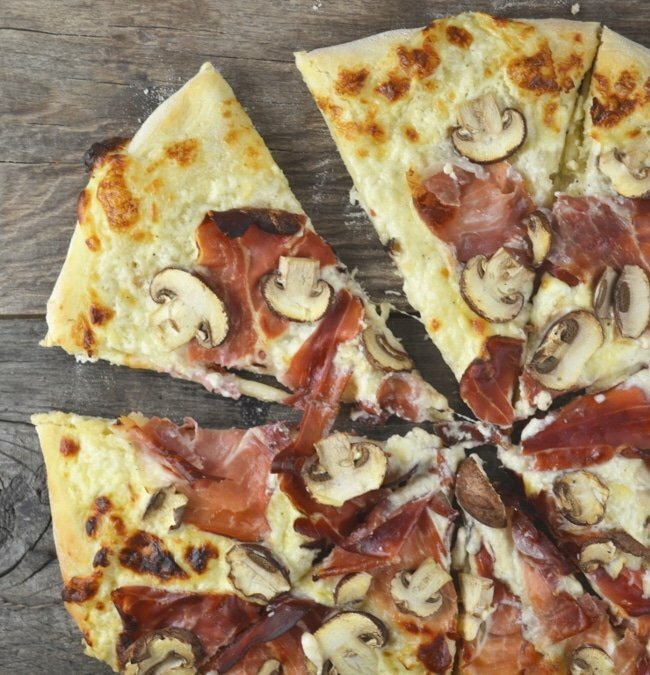 It melts perfectly and tastes incredible on this cheesy speck and mushroom pizza! To make my cheesy white pizza base even more delicious I season it with salt and pepper and add 1 crushed clove of garlic, ooosht! You can’t go wrong with cheese and garlic. *This post contains affiliate links which means I earn a small commission if you purchase a product through those links. I can assure you I will never recommend a product I don’t genuinely love and use myself. I then top this cheesy thing of beauty with chestnut mushroom (cheese and mushrooms are always a perfect combo) and smokey, salty Speck – a delicious Italian cured meat available in most large supermarkets and Italian delis. All the flavours here work perfectly, the indulgent cheesy base, earthy mushrooms and then the smokey, saltiness you get from the speck is amazing. Every time I make pizzas I ALWAYS make my own dough because it’s so much more delicious than shop bought stuff and it’s really easy to make. The trick is to make sure you knead the dough long enough until it’s silky smooth and springs up when a finger is lightly pressed into it. I can understand that it can seem quite a daunting task when you’ve never done it before, or maybe you have and it didn’t work right? But once you make it this way you’ll realise how good it is and it will soon become like second nature to you. 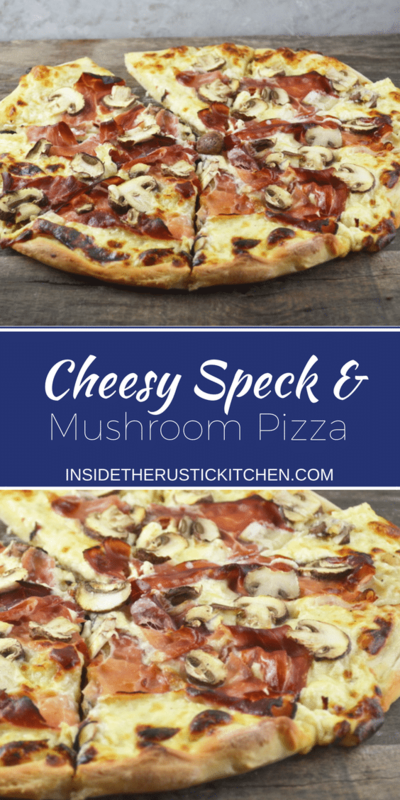 Did you like my Cheesy Speck and Mushroom Pizza recipe? Then let me know in the comments below, I’d love to hear from you! P.S Don’t forget you can save this recipe for later on Pinterest below. 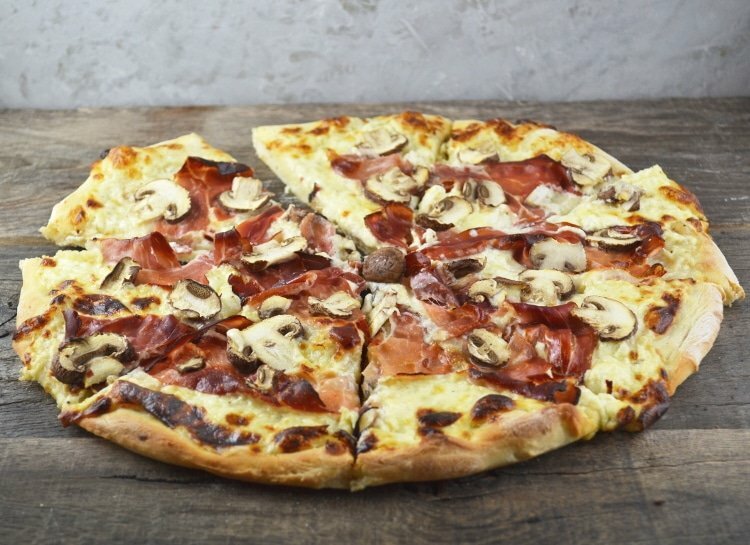 This Extra Cheesy Speck and Mushroom Pizza is to die for! Get prepared for the most delicious pizza you've ever tasted and it couldn't be easier! Add the yeast to the lukewarm water with 1/2 tsp sugar for 2 minutes. Combine the flour and salt in a large mixing bowl. Make a well in the centre and add the water/yeast mixture whilst mixing the dough together with your hands or a metal spoon until you have obtained a dough. If it's too sticky you can gradually add a little more flour. Dust a clean work surface with a little flour and knead the dough for around 10 minutes until it's silky smooth and soft. If you lightly press your finger on the ball of dough it should spring back up easily. Add 1 tbsp of olive oil to a large clean bowl and rub all over until the bowl is coated. Shape the dough into a ball and place in the bowl, rub the top of the dough with a tiny amount of olive oil. Cover with cling film and leave in a warm place for at least 3 hours until doubled in size. When you are ready to make the pizzas pre-heat the oven to 225°C. Divide the dough in half roughly with your hands. Lightly dust a work surface with flour and begin to roll out your first half of dough. The pizzas can be made round or rectangle depending on your baking trays. Roll out the dough as thin as possible without tearing around 30cm in diameter. Lightly dust the baking/pizza trays with semolina then place the dough on the tray, repeat with the second half of dough on a separate tray. For the topping add the grated cheese, sour cream and crushed/grated garlic to a bowl and season with salt and pepper. Mix everything together until thoroughly combined. Divide the mixture between the two pizza bases and spread out evenly. 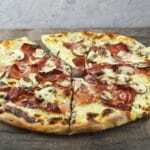 Top each pizza with layers of speck and then finely sliced mushroom. Bake in the oven for around 10 minutes until the base is crisp and cheese bubbling and melting. 35 minutes plus 3 hours rising time. This pizza looks absolutely incredible! I love pizza so much! I can’t wait to try this! There is nothing better than real Italian pizza. I’ve got to try this dough recipe. That is actually one of my favourite combos – a really good regional ham such as speck and mushrooms. Love it! Your pizza looks heavenly. Last week, we ordered a pizza with prosciutto but it only had a “speck” on each slice. Do you mind if I show them your photo so they can see what it should look like? LOL Your pizza loods and sounds amazing! I don’t think I’ve ever had speck before, but this sure looks incredibly delicious!